This fictional caper involves drug smugglers operating on a laid-back, pristine little island somewhere in the Caribbean. Where pirates and rumrunners once plied the waters under sail, the drug cartels now use speedboats and helicopters ­ and the cargo is not plundered gold and booze but pot and cocaine. The opening chapter develops the tone of resentment against the new breed invading this idyllic locale. Woody Cameron, the principal bad guy, sets up operations at an abandoned island resort that he has purchased, recruiting help among the riffraff eager to make a big score and the free spirits hoping to bankroll an island-hopping cruise, courtesy of the drug trade. Pete Mathews, proprietor of the Sandy Cay Club on a neighboring island, keeps a watchful and disgusted eye on Cameron and the comings and goings of his henchmen. This is a story of intrigue, drug busts, murder, and romance, with its share of humorous, rock-happy characters. Anyone who has visited or dreamed of visiting the Caribbean will be caught up in the story. Martha (Marty) Crikelair Wohlford is a professional writer who brings a wealth of knowledge and experience to her work. She has sailed all her life, is a private pilot, diver, photographer, musician, and graphic artist. She is a graduate of St. Mary's College, Notre Dame, Ind., where she majored in English Literature and Creative Writing. Her career began as a feature writer/editor for several newspapers, including the former Fort Lauderdale News (now Sun-Sentinel). She established her own public relations firm in the early 1970s, and her combination of photography, writing and graphics skills have resulted in numerous brochures, catalogs, ads, and image pieces for a variety of clients. 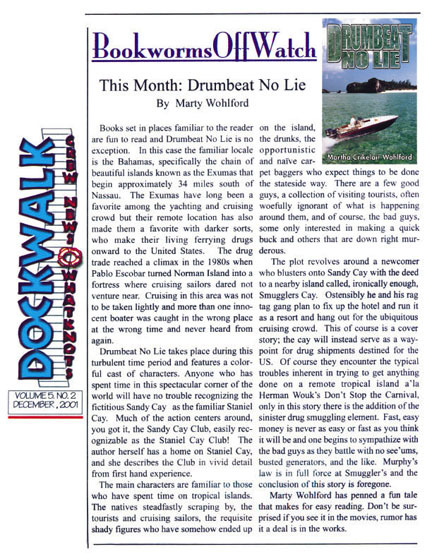 In 1991, she published the book Port Watching at Port Everglades. 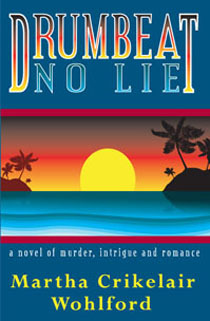 Drumbeat No Lie is the realization of a dream she has had since the 1960s ­ a dream delayed by career and family. At last she is doing what she has always wanted to do. 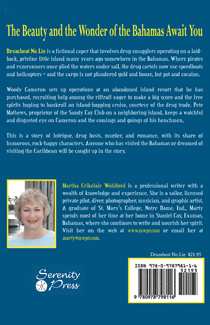 Marty mostly lives at her island home in Staniel Cay, Exumas, Bahamas, where she nourishes her spirit. The book has a new look and new ISBN, published by Serenity Press. Also by the author (non-fiction)...a book of hope for women alcoholics in recovery. Click on book to go to the web page.